“There is considerable international community interest in the preparations necessary for the referendum. In particular, the United Nations was requested last year to undertake a scoping visit to assess what its roles might be in supporting both the 2015 elections, and the referendum. The UN scoping team visited Port Moresby and Bougainville in February, and has recently provided a report to both governments, highlighting important issues about the work required, and proposing important roles that the UN can play in preparations for and conduct of the referendum. I rise to make a brief statement about a matter of the greatest importance to Bougainville. As we all know, the Bougainville Peace Agreement, which was given effect by amendments to the National Constitution, and the making of the Bougainville Constitution, guarantees that Bougainvilleans can vote in a referendum on the future political status of Bougainville. That referendum must include the “choice of a separate independence for Bougainville”. This is a momentous choice. Very few people’s anywhere in the world have the opportunity for a referendum on their self-determination. The Peace Agreement has been a remarkable achievement for all Bougainvilleans. The referendum must be held between mid-2015 and mid-2020. In other words, it must be held sometime during the term of the next ABG House. I am making this short statement mainly to inform this House, and through you, the members of the House, about progress made under this, the second ABG House, in making the necessary preparations for the referendum. The referendum is the third of the three pillars of the Bougainville Peace Agreement to be implemented. Considerable progress has been made on implementation of the other two pillars. As we all know, those two pillars are weapons disposal and autonomy. With weapons disposal, the UN mission in Bougainville supervised the weapons disposal process, from 2001 to 2005. Until mid-2003 the UN was assisted by the PMG. Almost 2,000 weapons were handed in by former combatants. With autonomy, there has also been considerable progress. We have together made the Bougainville Constitution, established our own institutions of Government, held elections for two ABG Houses (one from 2005 to 2010, and one from 2010 to 2015). Transfer of powers to the ABG started slowly, with the first requests for transfer made by President Kabui in 2006. During this, the second House, the progress with transfer has speeded up. We have taken over many new powers, and made new Bougainville policies and laws on a number of important subjects. From 2014, they have included establishing a separate Bougainville Public Service, a separate Bougainville public finance management system, and our own mining laws. Though we have taken great strides with both weapons disposal and autonomy, there is still work to be done to maintain and keep building both pillars. And much of that remaining work on those pillars is closely related to the third pillar – the referendum on independence. I will come back to those issues, and clarify the relationship of weapons and autonomy to the referendum, at the end of this statement. The Bougainville Peace Agreement was negotiated between June 1999 and August 2001. Although all aspects of the referendum that we could properly deal with then were covered in the Agreement, some significant issues could not be resolved at that time. They were deliberately left till later consultation and negotiations between the two governments. I will outline some of the most important of those issues still to be decided. But before doing so, I must emphasise that it was because there are so many referendum issues to be dealt with, that more than three years ago, my Government took up the issue of referendum preparations in the JSB. As a result, a Joint Referendum Working Group was established. It has been working ever since, and it reports regularly to the JSB. The ongoing work of that Joint Referendum Working Group has already assisted the JSB to make a decision, in 2014, on one of the most important issued that was deferred by the Peace Agreement. That was the issue of the agency, or body, that will conduct the referendum. The Peace Agreement and the National Constitution provided several options. Last year, the ABG and the National Government agreed that the referendum should be conducted by a completely independent institution, operating under a Charter that must be agreed between the two governments. Perhaps the most critical issue that was deferred by the Peace Agreement was the decision on when the referendum will be held – the date of the referendum. It was agreed, however, that it could be no earlier than 10 years after the ABG was established, and no later than 15 years. It was also agreed that the date within that 5 year window would be agreed between the ABG and the National Government. It is very clear from the wording of the Agreement and of the National Constitution that these matters are to be considered only for the purposes of setting the date within the five year period ending mid-2020. Issues about weapons and good governance cannot in any way be used to delay the referendum beyond mid-2020. Because the decision on the date was deferred, that is going to be one of the most important matters that the third ABG will need to consult about and agree with the National Government. I have already begun the discussions on the issue with Prime Minister O’Neill, suggesting that 2019 should be considered. But as yet there has not been a decision on the issue. The wording of the question, or the questions, that will be asked in the referendum – but I emphasise that whatever is decided, the Peace Agreement and the Constitution are clear that the “choice of separate independence for Bougainville” must be included. The qualifications for enrolment to vote in the referendum for Bougainvilleans not resident in Bougainville. The most important issue of all has also been deferred, till after the referendum. That is the decision on implementation of the decision of the referendum. Under the Peace Agreement, the two governments are also required to consult about that. But the compromise on the referendum made in 2001 was that power to make the final decision on implementation rests with the National Parliament. the referendum that will have to be negotiated. In addition, because neither the National Government nor the ABG has any experience of the conduct of referendums, there are many aspects of practical arrangements for the conduct of the referendum that will have to be decided jointly. Review of the constitutional provisions for the conduct of the referendum. The report recommended setting up a joint secretariat of the two governments to oversee the implementation of those seven work-streams. No decision has yet been made on that issue. 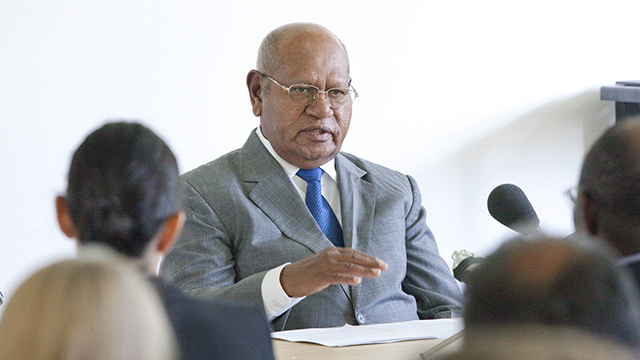 At the recent meeting of the JSB in Arawa on 13 March, the two governments noted the report, and agreed to meet to decide on the issues of the date of the referendum, and the charter for the independent agency to conduct the referendum, as well as other milestones for the conduct of the referendum. My Government has also moved to establish our own structures to oversee preparations for the referendum. In 2014, we established an ABG Ministeral committee to provide oversight, direction and monitoring of referendum preparations. It will need to liaise closely with the counterpart committee established by the National Parliament. Identify resource needs and report to BEC. There is considerable international community interest in the preparations necessary for the referendum. In particular, the United Nations was requested last year to undertake a scoping visit to assess what its roles might be in supporting both the 2015 elections, and the referendum. The UN scoping team visited Port Moresby and Bougainville in February, and has recently provided a report to both governments, highlighting important issues about the work required, and proposing important roles that the UN can play in preparations for and conduct of the referendum. I know all Bougainvilleans will support and welcome the close involvement of the UN as we continue to implement the Peace Agreement provisions on the referendum. While there is much to be done, important steps have been made. Much more will need to be done by the ABG after the election. Indeed, it is no exaggeration to say that negotiations about referendum preparations will be one of the most important responsibilities of the third ABG, taking office in June 2015. Those responsibilities will include making strenuous efforts to continue achieving progress in relation to both weapons disposal and good governance. Progress on those matters is important in at least four distinct but also closely connected ways. First, they are important in setting the date for the referendum, between 2015 and 2020. Disagreement between the governments on our weapons disposal status or good governance could push the date back towards mid-2020. But of course, such disagreement cannot delay the referendum after mid-2020. Second, weapons and good governance will be very important in determining whether the referendum is “free and fair”. Under the Peace Agreement, we have all committed to a free and fair process. There is provision for international observers to be involved. If weapons are available and in use, and if the ABG does not provide good governance, for example in the form of law and order, there are serious risks that observers will decide the referendum is not free and fair. Third, when the National Parliament comes to make its decision on implementation of the referendum outcome, it can decide what issues it takes into account in making its decision. If there are serious weapons disposal and good governance issues, they will be free to argue that it will not be safe for the people of Bougainville if independence is considered. Fourth, and finally, the international community will be watching closely. When Australian Foreign Minister, Alexander Downer, persuaded the Bougainville leaders in late 2000 to make a compromise on their position that the referendum vote be binding on the National Government, he indicated that the international community would support implementation of a free and fair referendum with a clear outcome. The truth is that we may need to rely on international community support at that time. So we Bougainvilleans need to make sure issues about weapons and good governance result in loss of international community support. There is clearly still much to be done to prepare for the referendum. But an important start on make preparations for this momentous decision-making process has been made in the five years this House has been in office. All of us here look forward to seeing the steps being made by the new, 3rd House, President, and BEC, taking office in June, as they take the major next steps towards the conduct of the referendum. I thank all those who have contributed to the progress we have made so far. The referendum will involve the single most important joint and democratic decision ever made by Bougainvilleans. I call on all members of this House and all Bougainvilleans, whether resident in Bougainville or living elsewhere, to work together to ensure that the referendum is a complete success, and provides a secure foundation for the future of Bougainville. 1) I assume that means that Port Moresby can overrule the result of the referendum, which appears to be somewhat of a conundrum. I agree with you Warwick, President Mormis will stand for a clear result for the referendum and must at all costs not let it be overridden by PNG. The two governments need to come together and sort out this issue well before the referendum politicking starts. The ABG needs to have the single mandate for the referendum. Anything short of this is valueless to the voting Bougainvilleans. You just cannot have a situation arise where the Bougainvillean people vote to become an Independent Sovereign Nation in its own right then only to have the vote squashed by a foreign colonial power. The first point on the agenda is to make sure this cannot be allowed to happen. This must be sorted out long before the referendum takes place. Yes, the eyes of many foreign supporters are watching closely the progress of Bougainville going back to what it once had. The independent Sovereign Nation of Bougainville of the Solomon Islands before the colonials came in and divided it up. Over he next 12 months you will see the bubbles of truth rise to the surface and the true agendas will be there for all to see. Bougainville has many financially strong backers in the international community to help develop the nation without exploitation and sacrifices to the countries integrity.